I haven’t been in an accident since I was a teenager… So getting hit was quite a shock. But I think it was worse for the young woman who hit us. The other driver took full responsibility. The Traverse was still drivable. So all we had to do was wait (45 minutes) for the police to show up to write a report. And file a claim with the other driver’s insurance company. While we waited we got to know the young woman who was driving the other car. She’s 17, just learning to drive and made a rookie mistake. I think that’s happened to all of us. And before we finished up with the business side of the accident we met her sister, her mother and her boyfriend — all who came to support her! Pretty nice, huh?! By 8PM Friday night we were finally back on the road and headed to Oklahoma City. We had another little adventure that night at the hotel involving a different young lady — dressed in a very tight, very small black dress coming out of a hotel room. But I’ll leave the details of that story out of our G-rated blog! The next day was Saturday — and I have to admit that it was not our best day. There wasn’t a problem with the people we met that day or the places we visited. I just think we were still a little shook up from the day before and some of the fun had worn off. 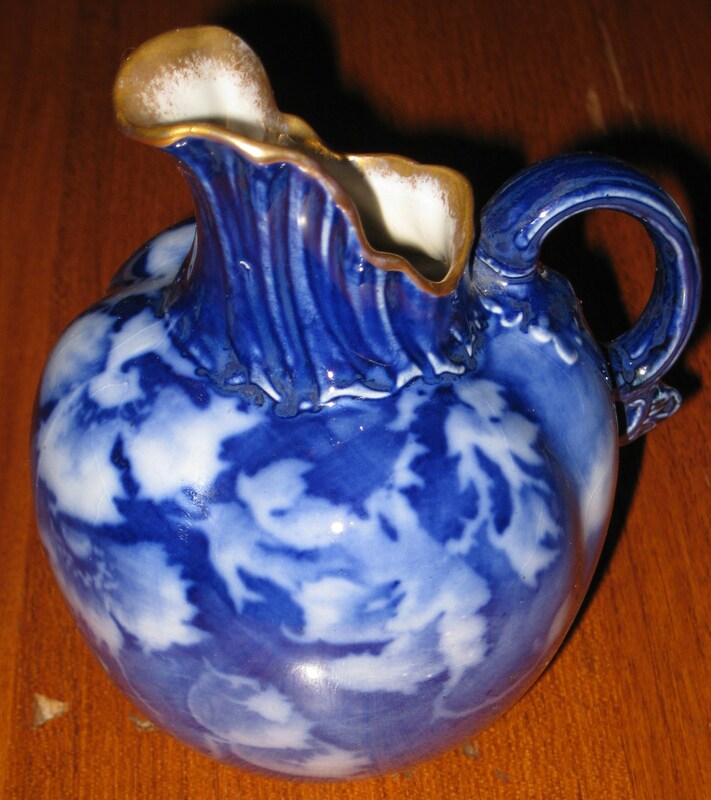 So after one stop at 23rd Street Antiques where we purchased a lovely flow blue pitcher and a Blue Aurene Steuben vase we headed back north. 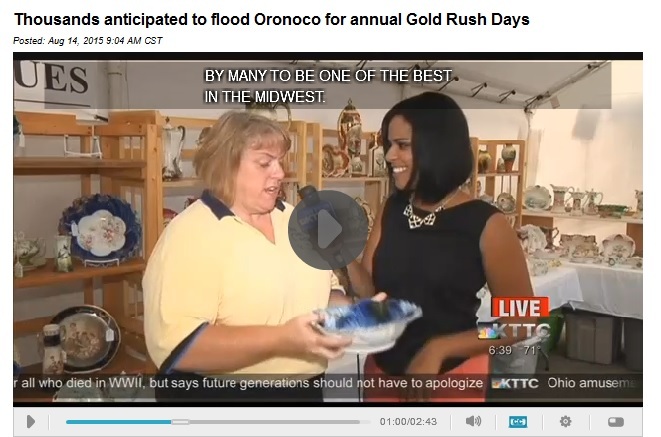 Sunday we stopped by the Overland Park Antique Show. Wow. Okay let me say that again. WOW! Okay, it cost me $6 bucks a person to get in. And Yes, there were only about 50 vendors. AND the vendors were willing to deal! 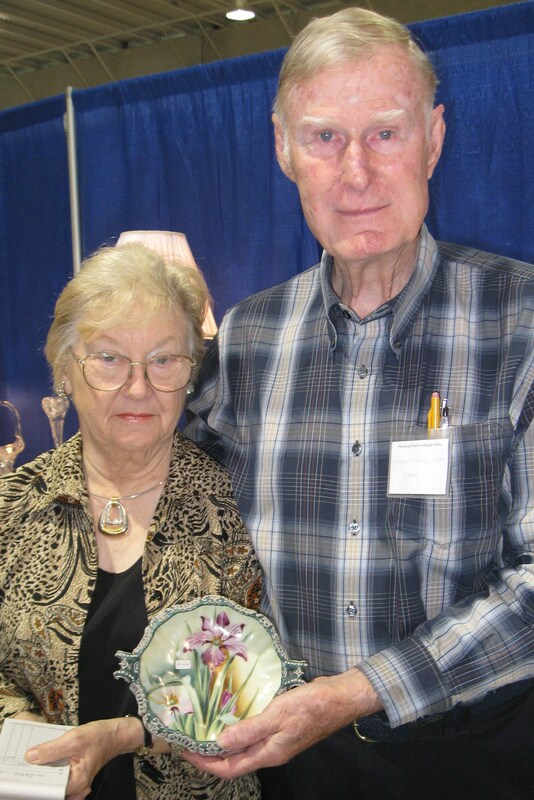 We saw more Tiffany, Steuben, Loetz, Pairpoint, Flow Blue and Brilliant Cut Glass at this show then we’ve seen in ALL OF OUR BUYING TRIPS PUT TOGETHER. It was magnificent! And as I walked the aisles I kept finding things that took my breath away. Honestly — this show is worth the drive — even if all you are going to do is ooh and aah. The vendors were VERY knowledgeable and the education itself was more than worth the door fee! Don't Let the "American Gothic" look fool you. These two are a HOOT! I have to admit at first glance we assumed everything was going to be out of our price range. WE WERE WRONG. Yes, there was a lot of high end art glass. 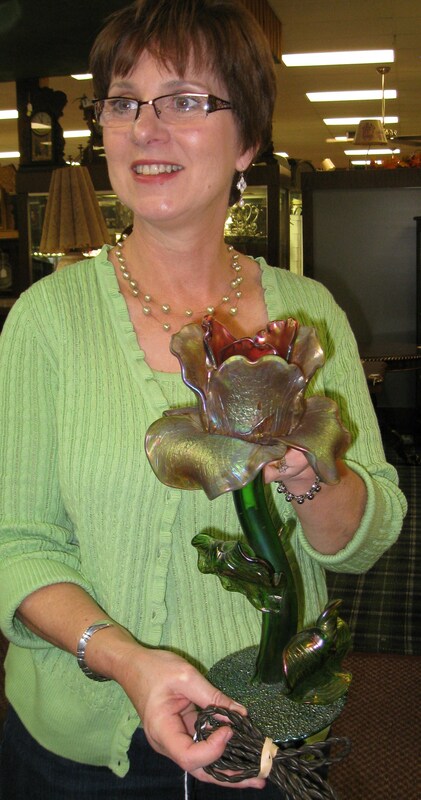 And high-end art glass is not cheap. But we found that the majority of the vendors were very reasonably priced. Mom found out that this was the place for a Good Deal and a Good Time! We also assumed that prices would be “firm” in this kind of venue. Once again, WE WERE WRONG. We found that with very little haggling we were able to negotiate a discounted price. This show was GREAT. And no doubt about it…we WILL BE BACK in 2011! So that’s the story of our 2010 Fall Buying Trip. We spent 5 days on the road together. We opened the door to build relationships with 4 more dealers. And we purchased 97 new items. All-in-all, even with the Wham Bam I think it was a valuable way to spend our time and money! Yep — It’s been an adventure! We spent Thursday in Missouri. The day started with breakfast. We found a “joint” outside of Harrisonville that had a pork chop breakfast special. Awesome! 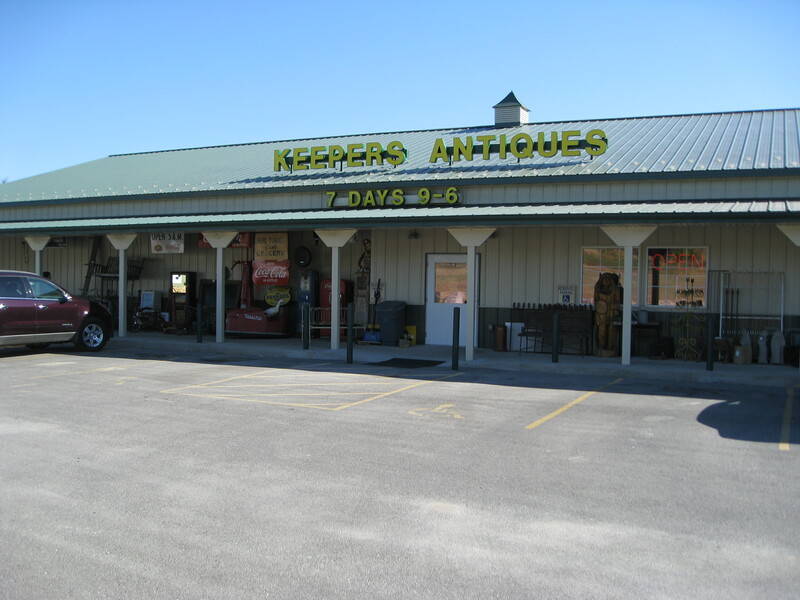 At 8:45AM we followed the staff into Keepers and started shopping. It was a nice first stop. We picked up four candlewick dinner plates, some salts and a great Geisha cobalt chocolate pot set. 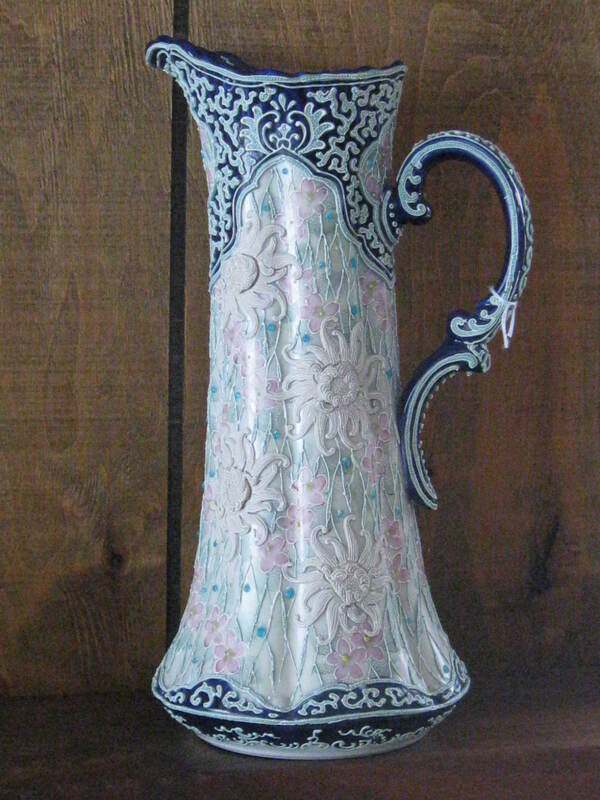 Then just around the corner we found a HUGE Blenko vase at Trade Fair. A short drive down I71 took us to Faithful Peddlers in La Mars. What a wonderful place — and the owners are AWESOME. This shop has two floors and Mom decided she was going to start up stairs. And of course, she found the good stuff including a Victorian Brides Basket and a nice RS Prussia bowl. On a personal note — I found a very unusual Spaghetti Santa Nodder — and NO, it is not for re-sale. We found ourselves having pancakes in Joplin, Missouri on Friday morning. Then based on another recommendation we headed off to Hidden Treasures. This is a neat little one-owner shop. He specializes in crystal, colored EAPG and Asian-ware — and while he didn’t have any moriage — during the hour we spent there I learned a ton! At that point we ran out of recommendations — so we went back to my internet research and decided to stop in Claremore, Oklahoma. As we drove into town we found a bunch of stores. After a quick drive-by we decided to stop in at the Hudson – Metcalf Antique Mall . I found Christmas presents for two VIPs. And after a quick conversation they sent us down the road to Tulsa to the I44 Antique Mall. 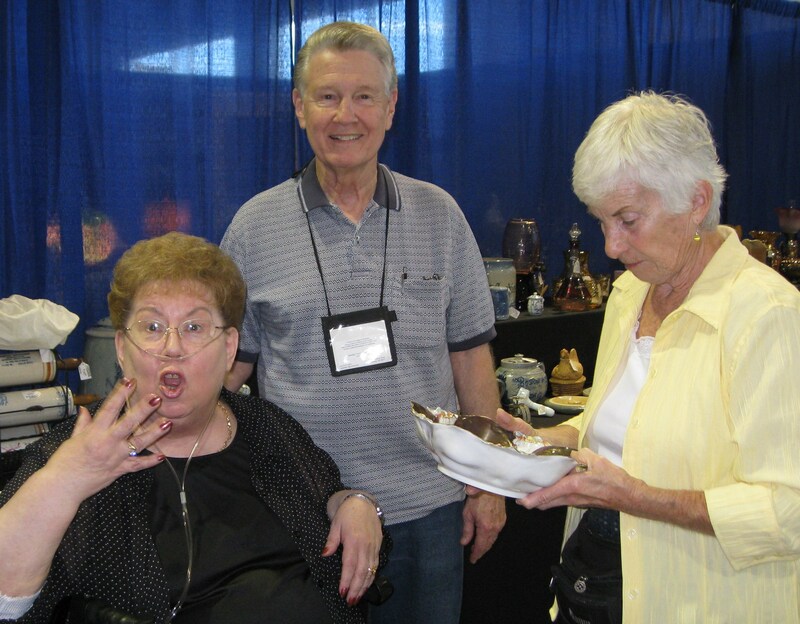 Specifically, they suggested that we visit “Marcia’s” booth. And for the first time during the entire trip I wished we had more money for inventory. Can you guess what Marcia is holding? Marcia had Gold Aurene, Tiffany, Irridescent Bohemian. Cameo Glass, Brides Baskets, RS Prussia, Victorian Vaseline, Blenko, Mary Gregory ..do I need to continue? With an hour to go before closing we identified our “like-to-have’s” — prioritized the items — and chose a cut-off point. Unfortunately I think I’m going to remember the Blenko we left behind. Then after a full day we headed off to dinner. 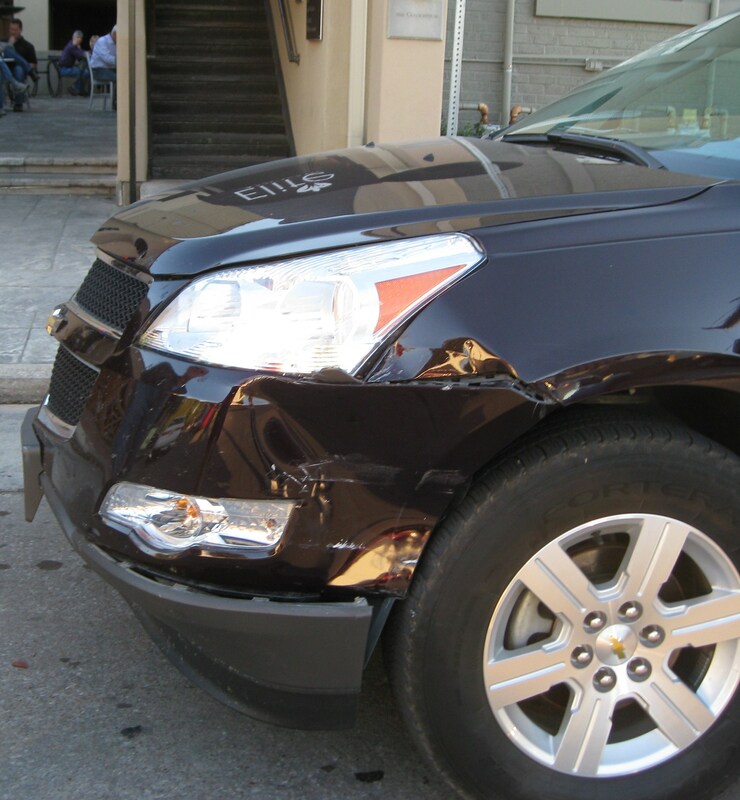 The next thing we knew — Wham Bam — a young driver smacked into my truck! I’m not just an antiquer — I’m also a golfer. So when the Kansas City Metro Chapter of the EWGA (Executive Women’s Golf Association) invited the Des Moines Chapter to join them for a golf outing in Grove, Oklahoma — I jumped at the chance. The carpool picked me up bright and early on Friday morning and we headed south on I35. We had a 6 1/2 hour drive ahead of us — and I had antiquing on my mind! 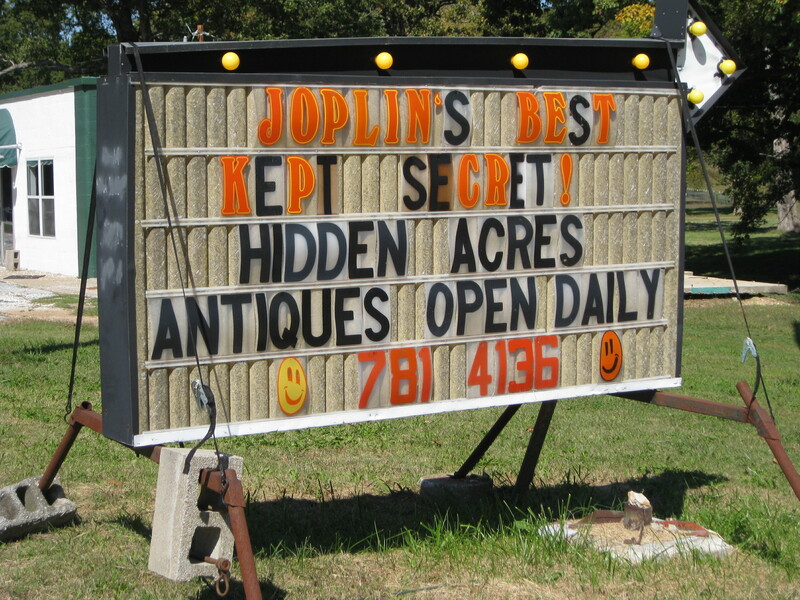 I love to drive I35 because Missouri has this antiquing thing figured out. Every 45 minutes there is a GOOD antique shop — just off the highway. So you can drive 45 minutes — and then shop for 45 minutes. Drive 45 minutes. Shop 45 minutes. Yep — it takes a lot longer to get to Kansas City — but it’s worth it! I love this place. They have great dealers with beautiful merchandise. But the one thing that makes them stand out is that the people behind the counter really know their dealers and are more than willing to call them and negotiate for you! And if you are looking for something specific — they know just where to look. Did I tell you I love this place? My golf mates were very kind — and agreed to stop. To save time I had planned to just shop 3 of my favorite dealers — but the gal behind the counter suggested I look in two additional booths. And that ended up being good advice. 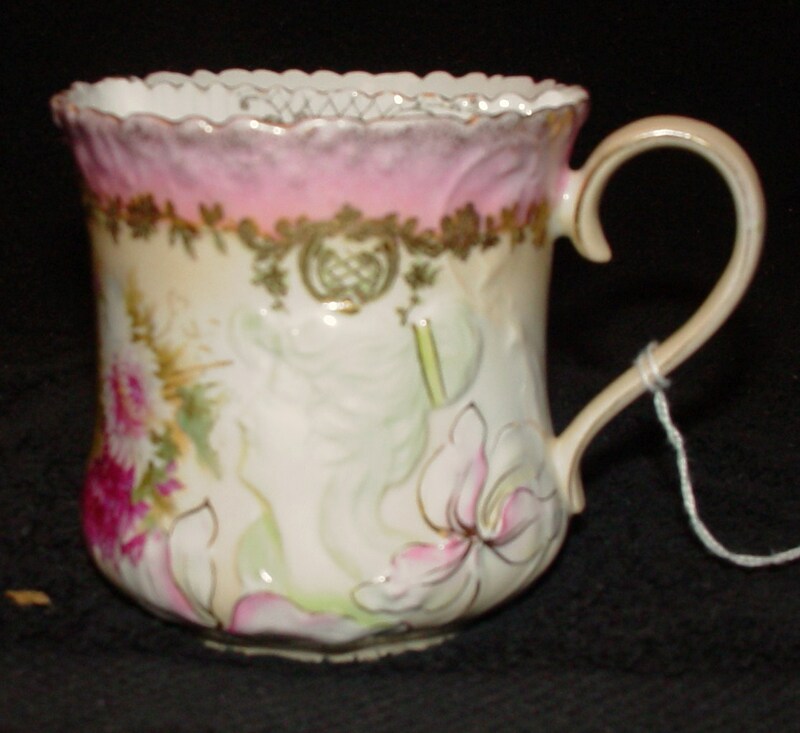 I found an unusual RS Prussia Hidden Image Shaving Mug for one of our regular customers. And two pieces of Czech glass that I know will draw a lot of attention in Oronoco. I admit I wanted to spend more than 30 minutes shopping. And for the rest of the trip — every time I saw a sign for a mall or spotted that antique flag flying — my heart fluttered and it broke my heart to drive right on by. But I know I’ll be back. Earlier this year we decided that it was time to do a little picking in Oklahoma and Texas. And now I have a travel plan in mind. I-35, US-71, I-44 — here we come!